Photo wedding thank you cards are a perfectly unique and personalized way to send a big "Thanks" to your wedding guests. Show them you really care by lending your own personal touch. Make the thank you cards yourself! Create thank you cards that are crafty and handmade by putting together scrapbook style cards, or use a photo editor or digital scrapbooking to design your own printed glossy photo thank you worthy of a frame. 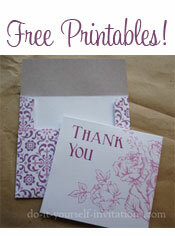 You can make your own wedding thank you cards that are simple to make as well as affordable. I want to share a couple of my DIY ideas for photo wedding thank you cards. Create Your Own Homemade Cards. 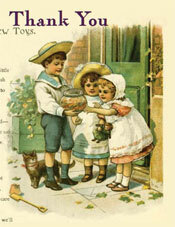 Start by creating your own homemade cards using a sheet of 8.5 by 11 inch, or 12 by 12 inch cardstock. To create small folded cards all you have to do is cut a sheet of the cardstock in half, score it across the middle, and fold it in half. Viola! A handmade folded card! measure the front of the card and cut some deocrative scrapbook or handmade paper to the exact same measurements. Use some glue (my favorite is glue runner adhesive) to affix the paper to the front of the card. Use a heavy duty large paper punch to punch a hole into the upper right hand side of the card (or wherever else on the card floats your boat). I used an oval paper punch, but you could use any shape you want. From circles and squares, to decorative shapes like leaves and scallop circles! Get as creative as you please! Well they sure aren't photo wedding thank you cards without the photo! Choose a photo form the wedding, or you could even choose a different photo for each card featuring the guests you are sending the card to. A lot of work I know, but a very thoughtful gesture! Use some glue or photo corners to attach the photo to the inside of the card. Make sure the photo is arranged so that when you shut the card the photo shows through! 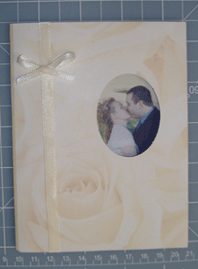 To add a last sweet detail to the card simply glue on a ribbon running down the left side of the card. I like to lay my ribbon onto some scrap paper and run an adhesive runner over the back of the ribbon. After attaching the ribbon snip the edges that over hang the edges of the card. Tie a little bow using the same ribbon and glue that right over the ribbon attached to the card. Make the cards a gift of their own by using wallet sized wedding or honeymoon prints. Attach them to the inside of the cards using scrapbooking photo corners. This way your guests can take the picture out if they want and transfer it to a small frame, photo album or wallet. A great place to get affordable wallet prints online is Snapfish.com by HP . You just upload your digital photos and they will either send the prints to your house or you can even get them same day by having them sent to a photo kiosk or development center. I love using their service! I took a much larger picture and cropped it down and took out most of the background "noise" so that the picture only shows my husband and I having our first kiss as Man and Wife. I then set it up to print several times to one page. I cut them out individually to attach to each card. Designing your own photo wedding thank you cards can be easy and you don't necessarily need special software to do it. I want to share with you some of my top free online resources, as well as free downloadable software and creative photo taking tips. A Simple Photo Thank You. Creating your simple photo wedding thank you card does not have to be super complicated. A photo with a simple "Thank You" will suffice. If you've got a photo editor installed on your computer than this is simple! Just open the photo and type away. Have the pictures processed (or print them yourself) write something personal on the back and send away! But there are also many other free photo editing resources available and ripe for the picking! Here is just a few to choose from. Happy downloading! 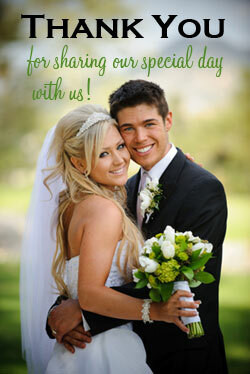 The photo you choose can make or break you homemade photo wedding thank you cards. Some popular choices are a nice bride and groom shot, the first kiss as man and wife, or their first dance. But why not get creative? If you know ahead of time that you will make your own thank you cards, you may want to keep a few shots in mind for your wedding photographer to indulge in. Creative chalk board Thank You. Bride and groom stand in front of a large chalk board with lots of doodling and drawing plus a big "Thank You" all written out with different chalks. The honeymoon beach shot. Exotic beach locations are a popular choice for honeymooning. Have a shot taken of the two of you lounging on the beach with a big "Thank You" drawn in the sand. Digital scrapbooking is becoming ever more popular on the web. I love a good scrapbook but what I find infinitely more useful for digi scrapbooking site is for designing homemade cards and invitations! There are tons of online websites you can visit to put together a small printable digital scrapbooking pages. Many are sites in which you must buy the graphics and online "papers" and "stickers". But there are a few that I know of that are free to join! These websites are awesome! You can upload your own photos and even graphics. They have lots of themes to choose from and each pack comes with it's own background patterns, "stickers" and other digital embellishments. You can get really creative and when you're all done they allow you to save as a Jpeg file and print it. You even have the option to upload to an online printer and have your project printed for you!